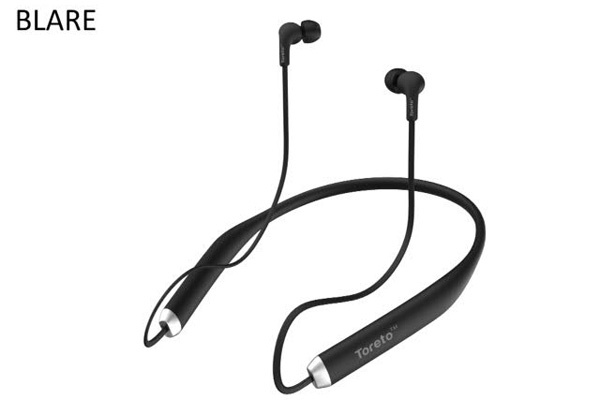 MUMBAI: Toreto, a noteworthy leader in the innovative and portable technology, has today launched a very stylish, flexible, water resistant Bluetooth Earphone, ‘TBE-804 Blare’. Can you imagine going for a run or gyming without music? Is it a long way to work? Then, don’t worry as Toreto’s TBE-804 Blare Bluetooth Earphone will come handy to you. You can now play music for eight hours straight and have a talk time up to 10 hours. The stunning noise reduction capacity and isolating features make it worth every penny. You will get nothing but absolute crystal clear, powerful sound with really strong bass. Forget unnecessary buzzing and humming noise and experience crisp HD sound quality with Blare. Its Bluetooth version V4.0 is energy efficient, signal stable and optimized for longer battery life. The Bluetooth 4.0 is meant for fitness and health. So whether you’re on a run or taking serious fitness training, these earphones will be your ultimate energy booster. The Bluetooth supports every Bluetooth enabled mobile phones, speakers, PCs and other devices. With an amazing 160 mAh battery life, you can totally rely on it when you’re outside with only two and half hours of charging. This Bluetooth earphone works phenomenally well even at a range of 33 feet or 10 meters. Smart features carved on the flexi band of the earphone; just make your life easier in managing multiple tasks at a time whether it is to answer or end calls, skip tracks and using in-line microphone. On top of everything, the comfortable silicon ear tips will make your hearing experience just perfect. Its sleek design with rubber finish adjusts around your neck just right enabling zero hassle in handling the earphones. The handy device is a delight for sports enthusiasts, for outdoor activities, jogging and even a walk in the rain. Its flexibility and water resistant features will rejuvenate the fun activities you wished for. Come monsoon, you will rekindle your music experience with Toreto - TBE-804 Blare Bluetooth Earphone. · Supported Devices – Bluetooth mobile phones, Bluetooth speakers and other Bluetooth devices. MUMBAI: Bluetooth headphones are growing in popularity as more people realize the convenience of wire-free listening. Dropping prices and availability of feature-rich wireless headphones at under Rs 5,000 also play a key role in making them much sought-after these days. MUMBAI: Echo Phonz BT 500 - that is what one of the leading mobile accessories and peripheral brand Advent has named its latest Bluetooth headset. MUMBAI: Taiwan based handset manufacturer, HTC, has rolled out a high end version of the HTC One E9 smartphone in the form of the One E9s. The smartphone features a 5.5 inch AMOLED display with high definition resolution and Corning Gorilla Glass 4. MUMBAI: One of India’s leading supplier of products and accessories for computers, consumer electronics and communication, Top Notch Infotronix, has introduced its first 2.1 speaker system, the ZEB-BT3430RUCF multimedia 2.1 speaker, under the brand 'Zebronics'.